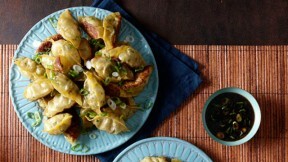 Homemade dumplings are easier to make than you think, especially since you can buy the wrappers. When the dumplings are steamed and browned, like these are, they are also called pot stickers. In a small bowl, combine the soy sauce, sesame oil, sugar, vinegar, and 2 Tbs. of the sliced scallions. Set aside. Heat 2 Tbs. of the oil in a 12-inch skillet over medium heat. Add the ground pork and cook, stirring occasionally and breaking up the meat with the edge of a spoon, until it is no longer pink, about 5 minutes. Pour off any excess liquid. Add ½ cup of the remaining scallions and the ginger and cook until the scallions begin to soften, about 1 minute. Stir in the fish sauce and the chiles. Remove from the heat and cool completely. Stir in the mint and cilantro. Keeping the dumpling wrappers covered with a damp kitchen towel, carefully peel one wrapper from the stack and put it on a clean work surface. Fill a small bowl with water. Line a large plate with a damp kitchen towel and have another damp towel ready to cover the dumplings. Drop 2 tsp. of the pork filling in the center of the wrapper. Dip a finger in the water and lightly moisten the edges of the wrapper. Fold it in half and then seal it by pinching along the curved edge. Make a few small pleats on the curved edge of the wrapper by gathering the dough and folding it over onto itself. Seal the pleats by pinching along the top. Put the finished dumpling on the plate and cover with the damp towel. Repeat with the remaining dumpling wrappers and filling. Position a rack in the center of the oven and heat the oven to 200°F. Heat 2 Tbs. of the oil in a 12-inch nonstick skillet over medium-high heat until shimmering. Working quickly in batches of about 10, arrange the dumplings belly side down in concentric circles starting from the outer edge. Do not crowd the skillet. Cook until golden brown on the bottom, about 2 minutes. Pour in about 1/4 cup water or enough to just cover the surface of the pan, bring to a boil, cover, and cook until all of the water has been absorbed, 2 to 3 minutes. Remove the lid, reduce the heat to medium, and continue cooking just until the dumplings are puffy and dry and crisp on the bottom, 1 to 2 minutes more. Loosen the dumplings from the pan with a spatula, transfer to an oven-safe serving platter, and put the platter in the warm oven. Wipe out the skillet and repeat 2 more times with the remaining oil and dumplings. Sprinkle the dumplings with the remaining scallions and serve with the dipping sauce.